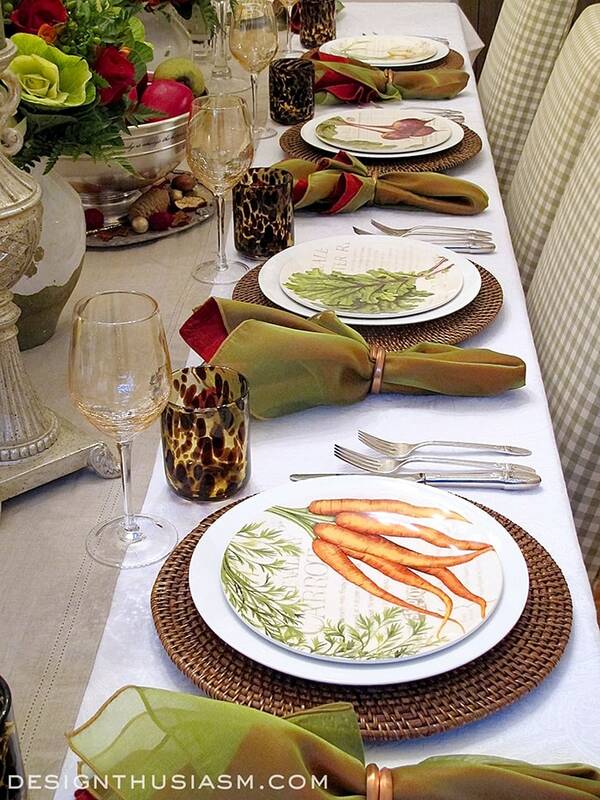 One of the easiest ways to add seasonal decor to your home is via your tabletop. Setting a transitional table is a natural way to bring changes to your home without spending a fortune and committing to expensive pieces. 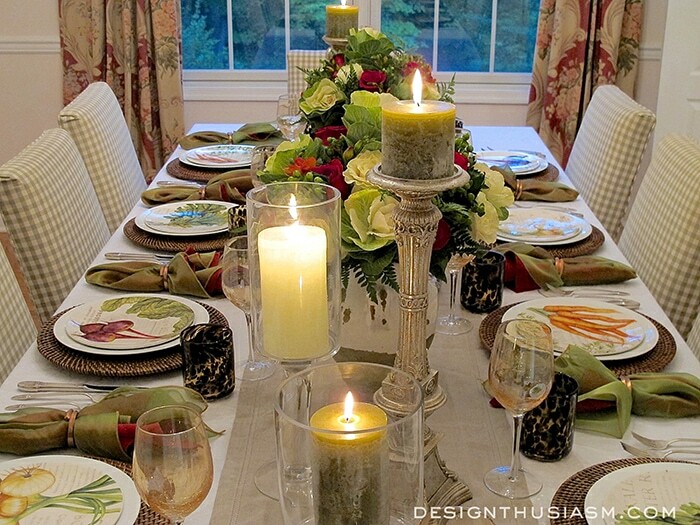 I often approach my tablescapes the way one would a monthly calendar, so for September I’m showing 7 ways to bring early Fall to your tabletop. 1. Apples – probably the single most identifying visual of September is apples. On this table, I’ve incorporated apples and pears in a perky centerpiece, nestled into a large serving bowl from Pottery Barn. 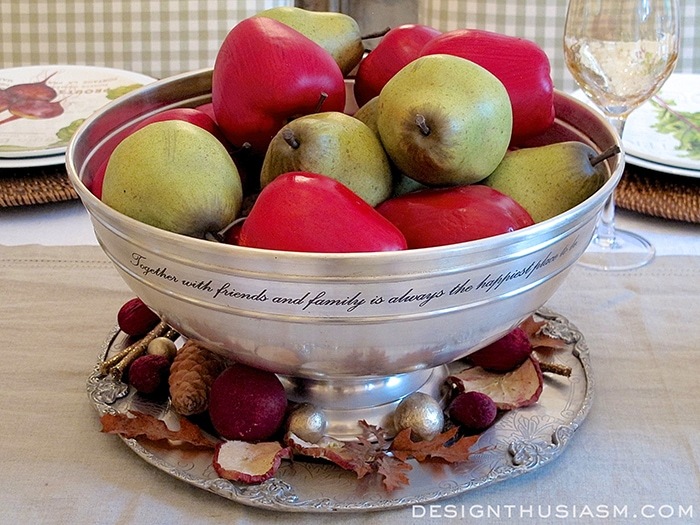 Scattered at the foot of the bowl are bits of apple potpourri, adding an early Fall aroma to the room. 2. 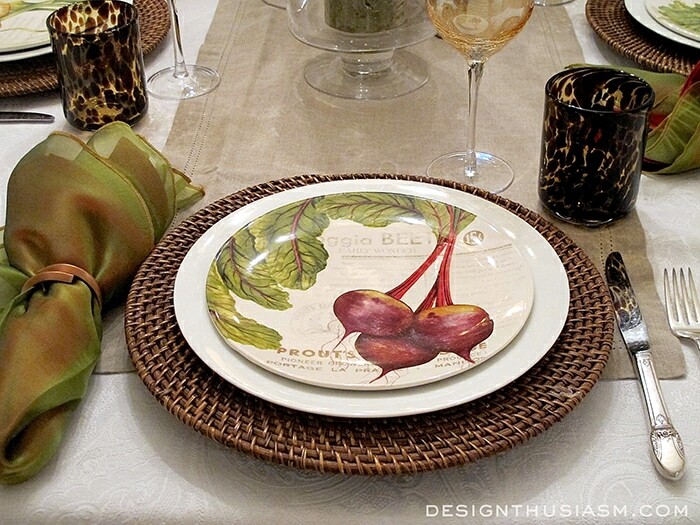 Root vegetables – these Farmer’s Market salad plates from Williams-Sonoma bring a touch of Fall color to your table while forecasting the coming harvest. Imagery of beets, carrots, kale and onions dance playfully across the dishes. 3. Rattan chargers – woodsy elements are a great way to transition into Fall. 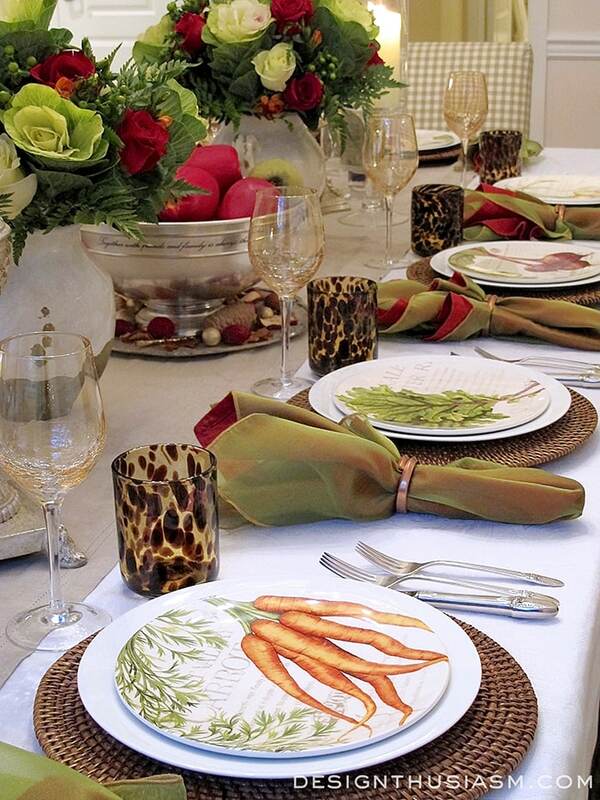 These rattan chargers are from Pier 1 and are the perfect backdrop for the a harvest theme. 4. 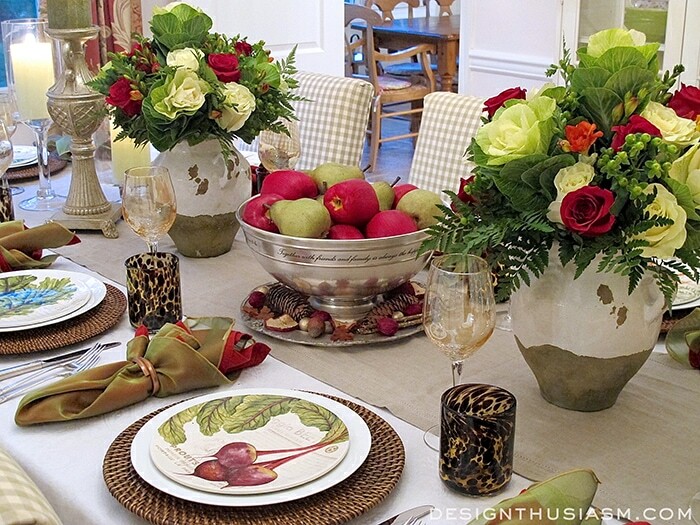 Fall floral – every table needs fresh flowers and for early Fall, the addition of cabbage leaves and berries brings just the right note to a colorful arrangement. This table is decidedly transitional, so I’ve opted for reds and greens, rather than a full-on Fall palette of oranges and golds. 5. 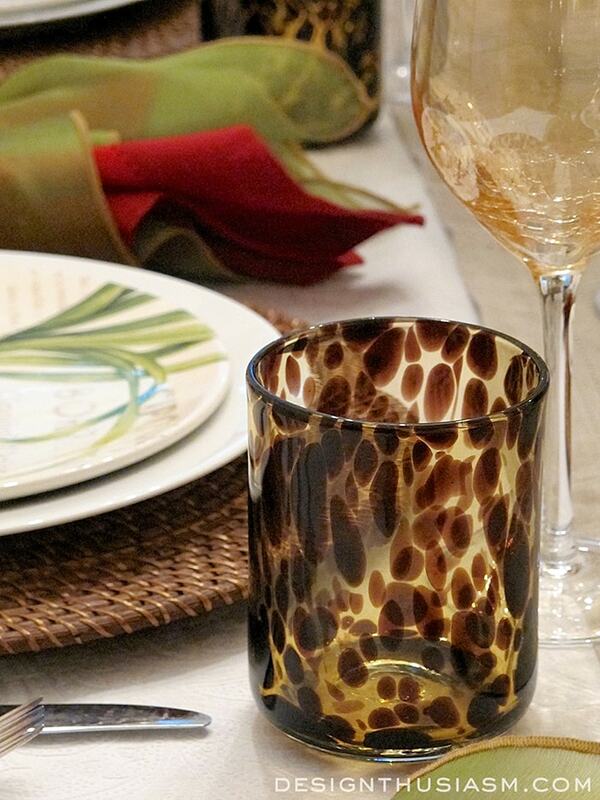 Tortoise shell patterned glasses – in keeping with the woodsy feeling introduced by the chargers, tumblers in a tortoise shell pattern, also from Pier 1, complement the tableau. 6. Leafy-toned candles – the pillars used here are in two shades of green, both channeling the feeling of the not-yet-turned foliage. 7. 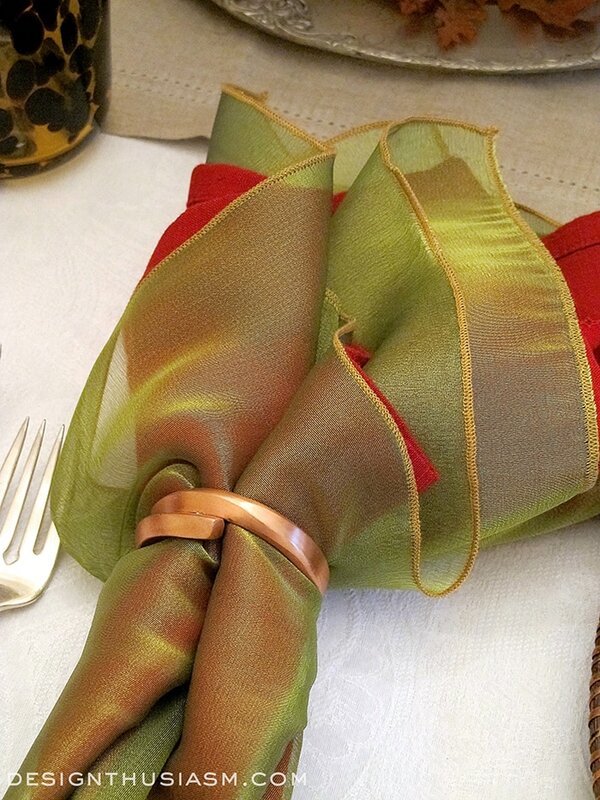 Hint of copper – for napkins I’ve layered a translucent pear green over a berry red, then punctuated the color mix with a lovely copper napkin ring. Napkins are from Pier 1, rings are from Crate & Barrel. For underpinnings, my base cloth is a white paisley tablecloth from Ralph Lauren and the natural linen runner is from Williams-Sonoma. These are classic essentials that I use over and over. 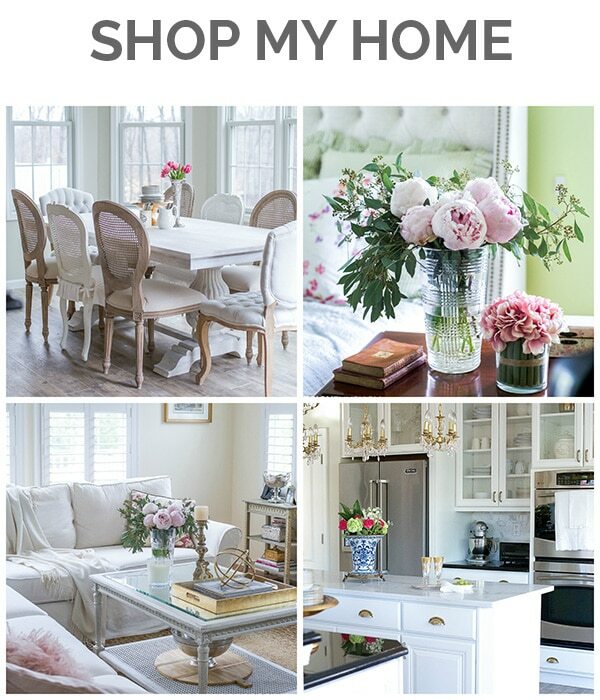 White tuscan vases are from Pottery Barn. In the coming months, these colors will be replaced by the brilliant and broad range of a classic Fall palette, but will be revisited come December. For now, I’m enjoying the transition into Fall and the celebration of its bounty. Thanks, Bev! This one was a lot of fun. The more thematic I can get, the easier the table is to dress… 🙂 It always starts with one visual and how it relates to the concept. Thanks for visiting! Very pretty! At first I thought your glasses were the votive holders at Pottery Barn. Lovely table and makes me feel like fall. What a beautiful table!! Esp. 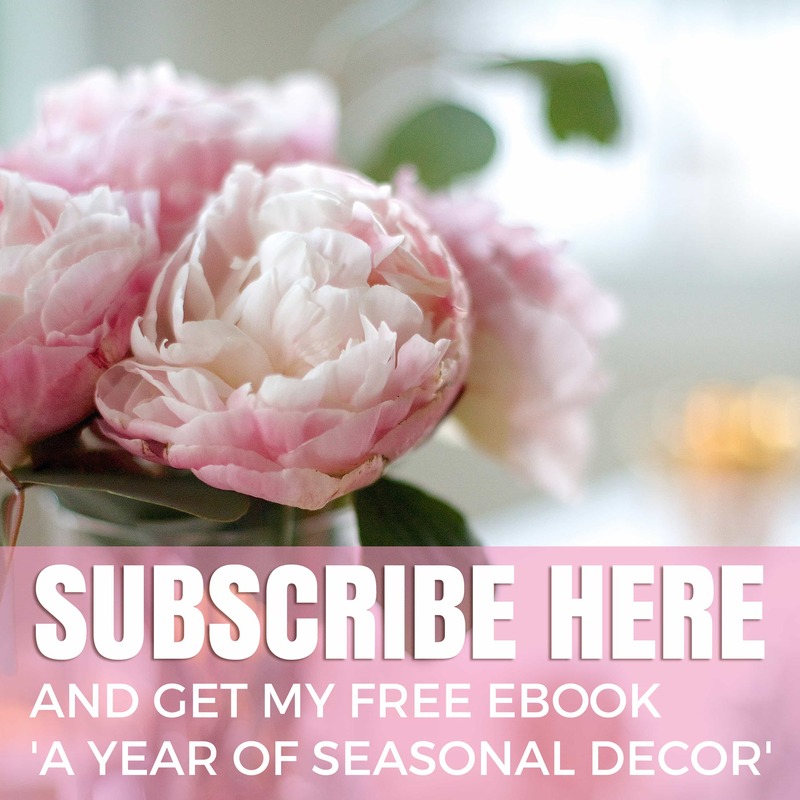 love the plates…….the florals are wonderful…….sophisticated, but not overdone!!! 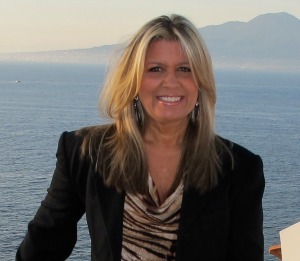 Just gorgeous, Lori. So glad to see someone else include apples for September. You create the prettiest tables. 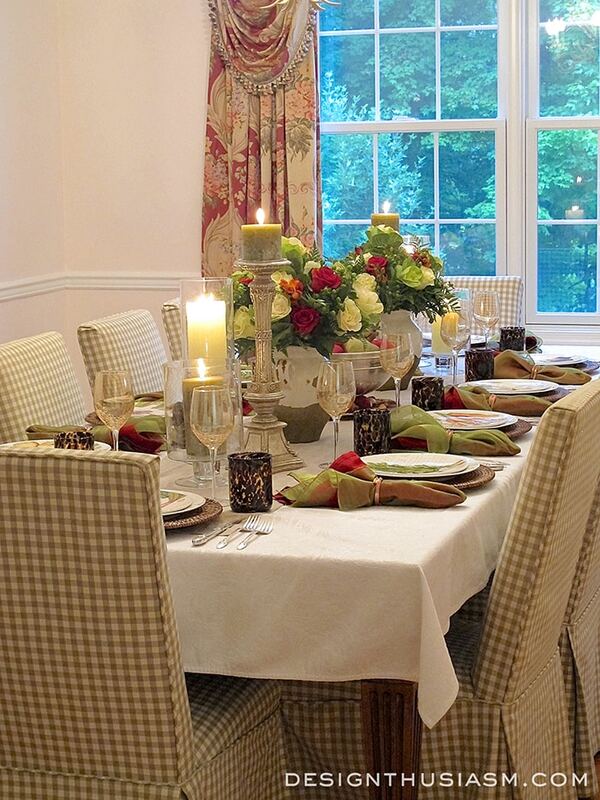 I would love to sit down to a meal at this table, it is beautiful and inviting. I love everything about it! It goes so well with your curtains. And the centerpieces are perfect! You have inspired me to try something new. Instead of jumping straight from summer to fall I will try transitioning. Thank you, Kimberly! It’s funny – in our new house, I actually have to be careful what will go with our draperies since our old dining room just had white panels. I always think of my home as very pale, nearly white colors, but we actually have a good bit of color here… 🙂 I’m glad this table inspired you! Your table setting is so pretty! I love the rich beautiful colors. Wow! The word that sprang to mind when I opened this was abundance! Beautifully executed and I have some fruit plates that I need to get out and use. Thanks, Pamela! So glad abundance is what came to mind, because I do love to celebrate the bounty of the Fall harvest… 🙂 I enjoy seasonal decoration because there’s something to celebrate unique to each month. 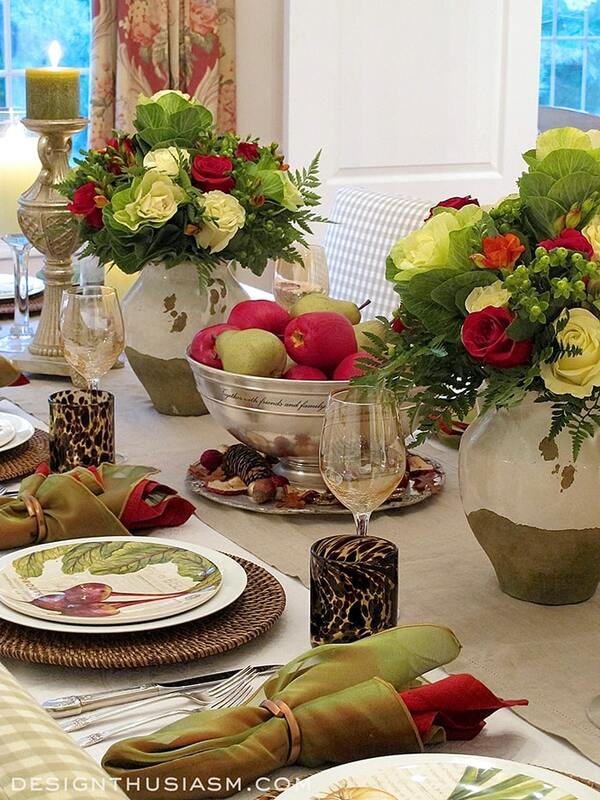 Just beautiful, love the gorgeous flowers you chose for your beautiful fall table setting…..
how you complimented them with the color scheme, and your florals are beautiful……. Stunning tablescape. 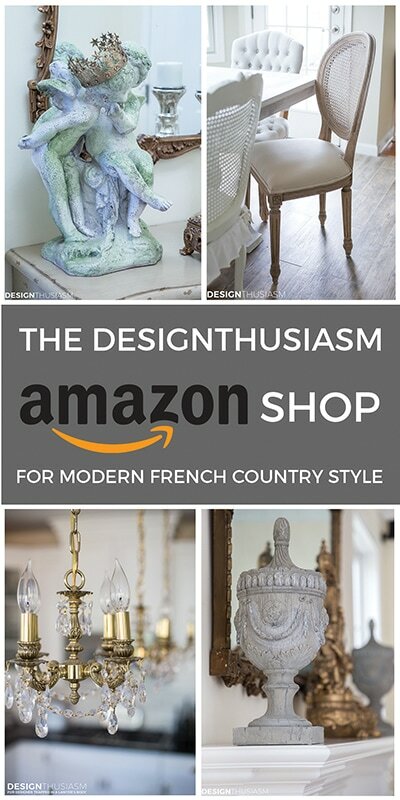 Are the Tuscan vases the small or medium size? Thanks, Mary! They are the small double handed urn. As always, very classy! I enjoy your style. Thanks, Diane! Such a nice thing to say… 🙂 Thanks for visiting!! 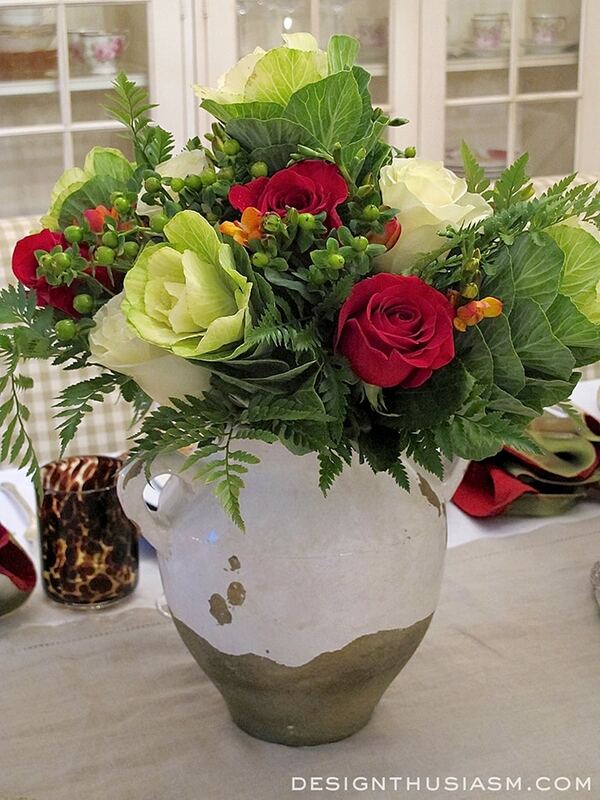 Lory: This is one of the most interesting floral arrangements I’ve seen in a while. 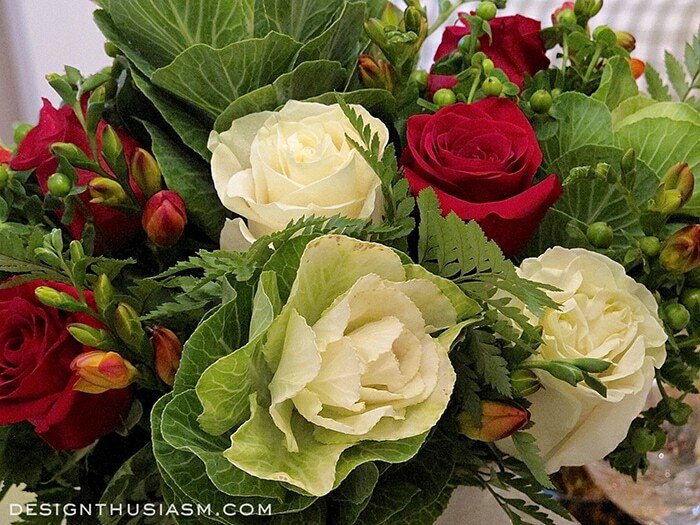 Cabbage leaves and red roses. Who would’ve thunk? The bowl with apples and pears is great! I have to tell you that my son, who is into feng shui, has asked me not to being potpourri into the house. He says it’s bad feng shui because it’s made from dead leaves and decaying fruit. He doesn’t have a problem with diffusers, so that’s what I use now. It’s funny when your children grow up and develop opinions. Lol! Lovely table, Lory. 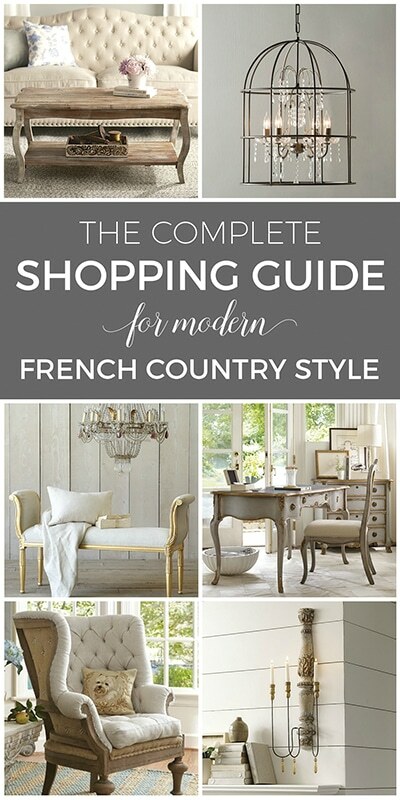 A perfect transitional table! Boy, these were such interesting questions you posed that I asked him. He says that you are correct. Furniture is made up of dead wood and cooked food is also dead. They all lack the circulating life energy called chi. The goal is to minimize the amount of dead chi that surrounds us in order to maximize health and happiness. It makes sense, I suppose, but I’m not getting rid of my furniture. ? Ha ha, I’m with you… 🙂 Unless you’re going to live outdoors, there’s really no choice, so you may as well enjoy nice furniture! Lori, this table is beautiful! I love the colors and would love everything exactly as you have it set. I wouldn’t change a thing! Color is so uplifting and I really love seeing it used in such a pretty way. 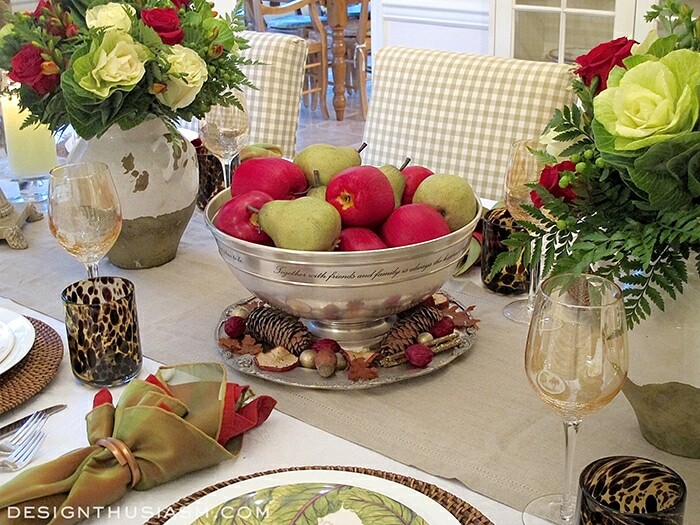 I agree that tabletops are an easy way to decorate for a season. 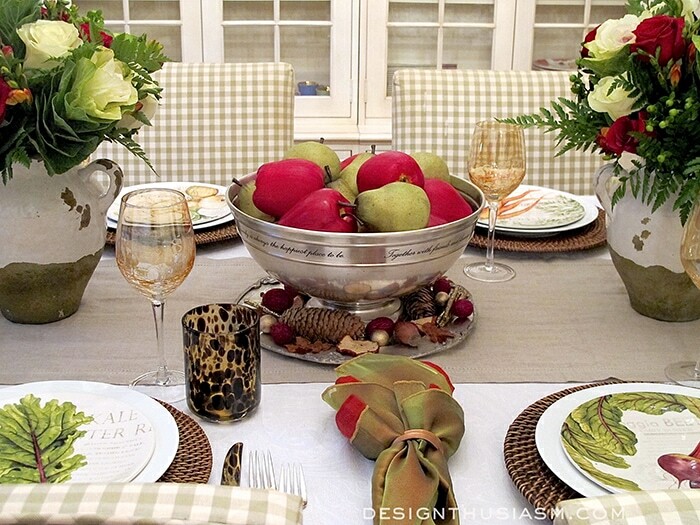 Your fall table is quite lovely, just full of beautiful things.